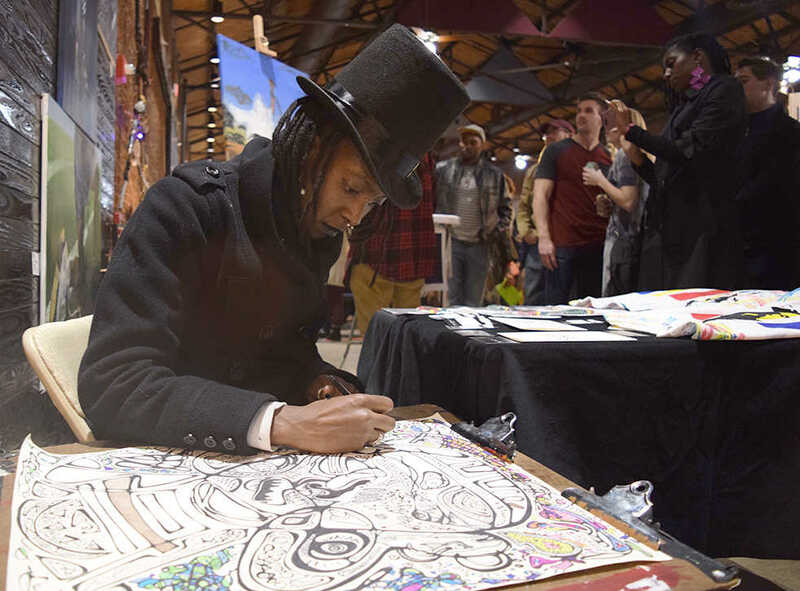 An arts and food event in downtown Atlanta, “Pancakes and Booze” was meant to be a gathering of artists, art appreciators and maybe people who simply love pancakes or booze. Unfortunately, the reality was that although there was something reminiscent to creative expression on display, it was mostly weak social critiques, lazily sexual non-art and bad photography. Looking at “Pancakes and Booze” as a case study in sociology rather than as an arts and food event is more interesting. With a line a couple hundred feet long outside, one would expect some fantastic art. However, heuristics failed to account for the fact that people are completely willing to stand in cold wind just because the event might look good on Snapchat. What could possibly draw people toward something so dry and so uninspired? The name itself is perfect advertising: “Pancakes and Booze” is a novel pairing, undoubtedly. Moreover, has anything with the word “booze” in the title ever been bad? Maybe not historically, but this event single-handedly proved that life will never be good as the expectation, even when evidence exists that it would. Art has always served an important role as social criticism. In 1937, after a small Basque town in Spain was bombed during Spain’s civil war, Picasso created one of the world’s greatest depictions of the chaos created by war. In contrast, the one piece that truly encapsulated the lack of artistry at the event depicted a naked woman, covering herself while chained to that little orange notification box from Instagram. Get it? She was trapped in the cycle that social media forces everyone into of needing strangers’ approval, how creative! Any of the 20 versions of that painting from the other artists who made their own negligibly different twists on it would also be good representations of the event’s uninspired artistic themes. In business, the adoption life cycle essentially breaks down the creation and adoption of new technologies and trends by groups of people: innovators, early adopters, early majority, late majority and laggards. Laggards is used to describe those who may as well have been in a coma until finally no longer being able to fight progress and acquiescing. “Laggards” serves as a perfect description of the crowd at “Pancakes and Booze.” Millennials have an appreciation for the arts in a way previous American generations simply do not, but the millennials at “Pancakes and Booze” were the ones who truly wished they did not have to pretend to like art. However, social pressure is a strong force, so pretend they did. Surely many walked away with the perfect #artsy Instagram. While this view may seem harsh and presumptive, the judgement came naturally after seeing grossly oversaturated photography sell like, well, hotcakes. The event’s turnout defies any other explanation as to why they would support not just uncreative but low quality art. Imagining that these people have simply been misguided is a far more comforting thought; the alternative is just too disheartening to contemplate.